Martin Meywerk is a full professor for Automotive Engineering at the Helmut-Schmidt-University in Hamburg since 2002 and dean of the faculty of Mechanical Engineering since 2014. 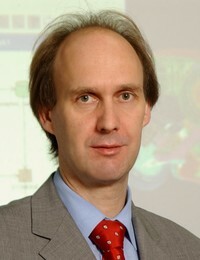 He gives lectures in vehicle dynamics, automotive mechatronics, computer aided engineering (CAE) and optimization. In research his focus is on dynamic behaviour of vehicles and tyres, driving simulators and CAE-methods in automotive engineering. In the past he had research projects with Volkswagen, BMW, Daimler, Bast and other companies. He has published several papers and one book. From 1997 to 2002 he was employed at Volkswagen AG in Wolfsburg in research and development where he improved CAE methods, from 2000 to 2002 he was lecturer for engineering mechanics and analytical mechanics at the Technical University Braunschweig (TUBS). He was a research assistant at TUBS from 1990 to 1996, where he wrote his Ph.D.-thesis at the institute of engineering mechanics. From 1985 to 1990 he studied Physics and Mathematics at TUBS supported by the Studienstiftung des deutschen Volkes.